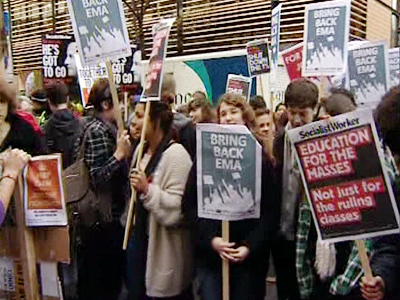 Several thousand students gathered in London to protest a hike in tuition, soaring youth unemployment and a host of other financial burdens. A splinter activist group tried to break away from this “tame” rally and march on parliament. It was planned that the protesters – who were marching under the banner ‘Educate, Employ, Empower’ – would mass near the Embankment, march past parliament square, avoiding the Houses of Parliament, and head to Kennington Park south of the river Thames for a rally. 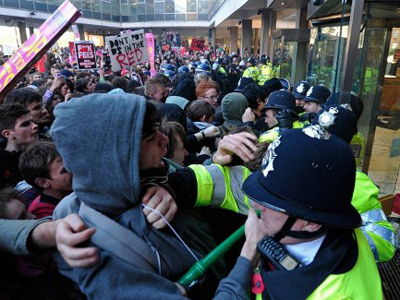 The route was devised by the National Union of Students (NUT) and the police. 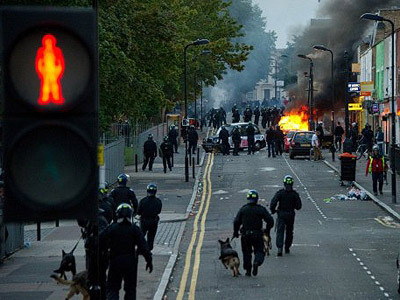 But as the majority of protesters were forced to take the preplanned route south of the river, by the time they got to Kennington, some of the students began to lose interest and broke off into pubs. 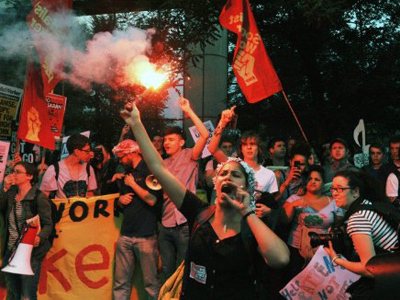 The event, organized by the NUT, is the first since a wave of demonstrations in 2010 when the coalition government decided to raise tuition fees. 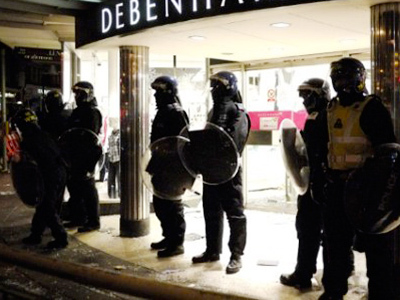 A similar protest two years ago ended in violence, with running battles with the police and demonstrators attacking Tory headquarters. This march was designed to broaden campaigns from student funding to the wider issues of joblessness and debt among young people in Britain. 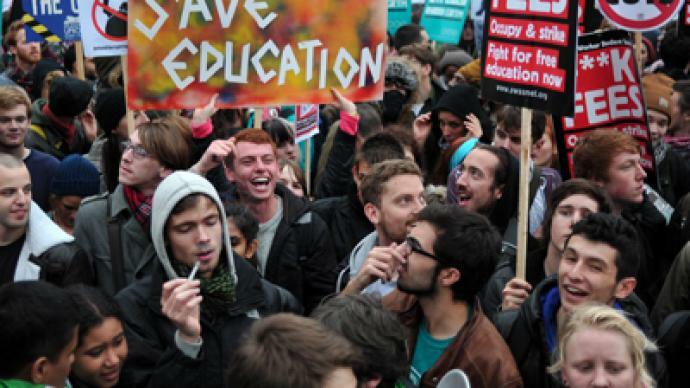 Since the UK’s coalition government came to power in 2010, tuition fees have tripled to a maximum of £9,000. Students are left with tens of thousands of pounds of debt before they graduate, and know that there is little chance of finding a job when they finally do finish their studies. Ministers have also decided to end the Educational Maintenance Allowance (EMA) grant allowing the poorest teenagers to stay in school and college before going to university. “There’s a sense of desperation that people have. They are slowly seeing opportunities taken away and are powerless to do anything about it,” Liam Burns, President of the NUT told UK newspaper the Guardian. A survey by the NUT of almost 500 parents found that three out of five would not vote for an MP who broke a campaign pledge to vote against tuition fee hikes. Nick Clegg, the deputy Prime Minister whose Liberal Democrat Party promised not to increase tuition fees as part of their election campaign, was forced to issue an embarrassing public apology at the party’s autumn conference in Brighton. Burns vowed that while some MPs kept their promise, the ones that did not can expect to be voted out in the next election and are living “on borrowed time."